You're right on this. I don't think you're underrated since most people who know your music love it. I would say that you're just underexposed... but so are most of the relevent artists who care more about their craft than fame. 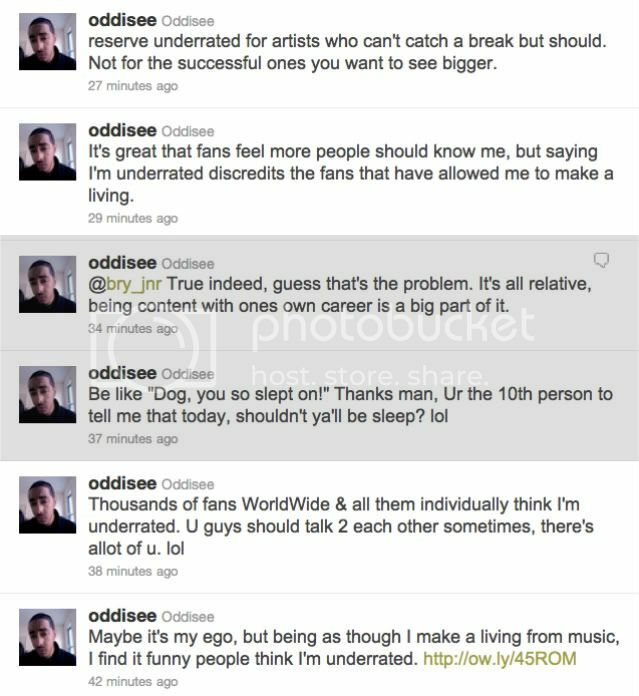 I understand how you feel Oddisee...I refer to you all when talking about how artists need to switch up their mindset. There is a quote you said to NPR, I'm paraphrasing "If you get 1,000 fans and they can give you $50 a year...you can live off of that" It's so true! That's a solidly middle class income. It seems you are fine with your career...everyone I know, knows you I'm from Maryland too. Keep living your life, forget a list. There is space out there for people but everyone wants be jay-z, naw be yourself. If I made a good/great working income from what I love eff a chain and ferrari I can pay my bills and I have disposable income. I kinda get what you're saying and kinda don't. Some dude feels like you should get MORE props why the world at large (always so quantifiable), and you get mad. Better to be underrated than overrated. well said, for real. i think that's a great way to view success. so glad to see in a culture that seems to pursue the exact opposite.